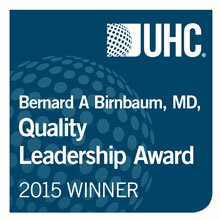 To honor the legacy of former UHC Board member Bernard Birnbaum, MD, who passed away on Sept. 14,2015, UHC has renamed the Quality Leadership Award the Bernard A. Birnbaum, MD, Quality Leadership Award. Emory University Hospital has ranked fourth in the nation among academic medical centers included in the 2015 University HealthSystem Consortium (UHC) Quality and Accountability Study and is a recipient of the 2015 Bernard A. Birnbaum, MD, Quality Leadership Awards, formerly known as the UHC Quality Leadership Awards. This is the fifth consecutive year that Emory University Hospital has ranked in the top 10 for demonstrating superior performance as measured by the UHC. The announcement was made at the UHC Annual Conference in Orlando, Fla., on Thursday, Oct. 1. The award honors top performers in UHC's Quality and Accountability Study, which ranks performance in the areas of: safety, mortality, effectiveness, efficiency, equity, and patient centeredness. These rankings are widely considered the most rigorous in health care and look at how major teaching hospitals are doing in multiple dimensions of quality and safety, and are traditionally looked upon as providing the best, most non-biased national quality measurement system available for academic medical centers. Emory University Hospital Midtown, which is Emory Healthcare’s other academic and eligible hospital, ranked 24th nationally. 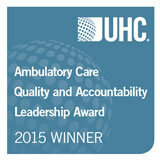 In a new award category this year, Emory Clinic ranked number five in the UHC Ambulatory Care Quality and Accountability Leadership Award. The award is given to academic medical centers that demonstrate excellence in delivering high-quality, patient-centered, efficient and effective outpatient care. Performance was measured in five domains: access to care, capacity management and throughput, quality and efficiency, continuum of care and equity. 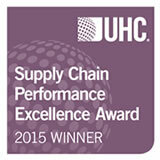 For superior supply chain management, Emory University Hospital Midtown ranked third in the nation among academic medical centers receiving the 2015 UHC Supply Chain Performance Excellence Award. This award is based on information from the UHC Operational Data Base and UHC members’ Centers for Medicare & Medicaid Services cost reports. The data measured includes supply expenses at the facility level and select clinical services areas. Supply chain management is becoming increasingly more important, as it helps standardize processes across the system and streamline costs. "The UHC rankings are a true testament of our expertise, teamwork, innovation and superior patient care we display and deliver every day to our patients and their families at Emory Healthcare," says Michael M.E. Johns, MD, interim president, CEO and Chairman of the Board of Emory Healthcare. "To be recognized as a top performer for both our inpatient and outpatient care and services is exceptional." "We are proud of the exceptional care we provide across the system, making Emory a top-ranking academic medical center on so many fronts," says William Bornstein, MD, PhD, chief medical officer and chief quality officer for Emory Healthcare. "We are especially gratified that these awards from UHC recognize the highest quality, safety, and efficiency of care across the continuum, spanning the hospitals and our ambulatory practice, demonstrating our commitment to excellence in all settings of care. Emory Healthcare, with almost 16,000 employees, is the largest and most comprehensive health system in Georgia. In fiscal year 2014, Emory Healthcare had $2.6 billion in annual net revenue and provided $85.3 million in charity care. System-wide, it has 1,870 licensed patient beds. Emory Healthcare is the only health system in Georgia with two Magnet-designated hospitals, Emory Saint Joseph’s Hospital and Emory University Hospital, for nursing excellence. Emory Healthcare's core purpose: "To serve humanity by improving health through integration of education, discovery and health care." For more information, visit www.emoryhealthcare.org. UHC, the alliance of the nation’s leading academic medical centers, and VHA, the national health care network of not-for-profit hospitals, have combined to form the largest member-owned health care company in the country. The combined organization serves more than 5,200 health system members and affiliates as well as 118,000 non-acute health care customers. Members range from independent, community-based health care organizations to large, integrated systems and academic medical centers.